Bao Noodles Brunch: Bánh Mì Please! I’m all about trying new things, especially when those new things involve brunch and ethnic cuisine. So when I heard about Gramercy’s Bao Noodles and their Vietnamese brunch menu, I had to try it. The extent of my Vietnamese culinary knowledge does not go very far beyond Phở, the classic noodle soup, and the translucent Vietnamese spring rolls, so I didn’t really know what to expect. Not much changed after briefly surveying the menu as the lack of descriptive explanations left me nearly as unaware as when I walked in. Luckily the waitress was very pleasant and extremely helpful in steering me in the right direction on what to order. The thing about this breakfast bánh mì is that just about anyone except dieters can appreciate it. Foodies will love it because it is a seemingly simple dish, but has the complexity of many elements coming together. Partygoers will love it for its hangover-curing greasiness. The hungry will love it because you get a lot of food. 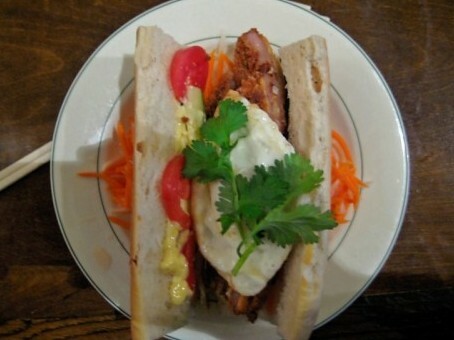 A huge baguette is loaded up with perfectly breaded and fried pork cutlet, tomato, Kewpie Japanese mayonnaise, pickled carrots and daikon for crunch, and topped with a fried egg. It looked so good that I almost didn’t want to disturb it. Almost. I dove in for the first bite, breaking the yolk and allowing it to coat the meat and vegetables as I maneuvered to take another bite. It was a delicious mess, hard to put down physically, not that I really wanted to anyway. It alone is definitely worth a brunch visit. I also tried the congee, a rice porridge popular in many Asian countries, which I’d liken to a salty oatmeal for those that are unfamiliar. 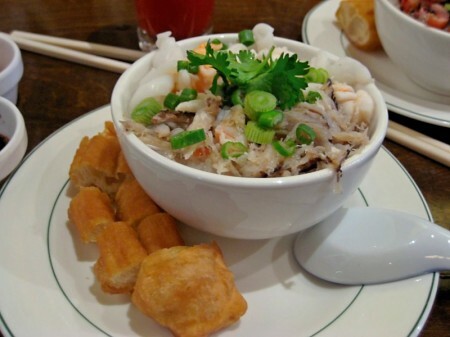 The congee itself was similar to those I’ve had at Chinese dim sum, except here it comes topped with your choice of seafood (shrimp, crab, and squid) or meat (pork, chicken and duck). I’d definitely recommend the meat variety over the seafood only because the meat is a more flavorful addition to the otherwise plain congee. With very limited veggie options, my vegetarian brunchmate got the Omelet with seasonal vegetables, which is served with yucca fries and vermicelli noodles. It was a very good omelet by any means, but was overshadowed by the unforgettable bánh mì. For only $9.99 including a cocktail, the brunch prix fixe is definitely a good deal no matter what you get. 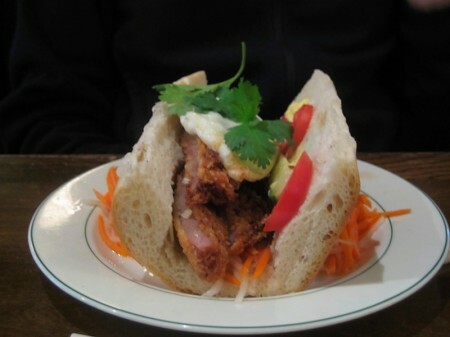 But just in case you still hadn’t figured it out, if you go to Bao Noodles for brunch you’re only cheating yourself if you don’t try the bánh mì.